Among the most sought after themes by legendary animator and director Chuck Jones are the classic moments in which Wile E. Coyote (aka Genius) has ordered anything from the ACME Company to better his chances of catching the Roadrunner. 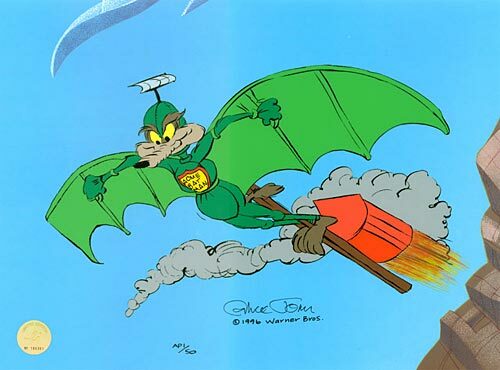 Possibly the most well known ACME device was the Bat Wings, certainly the final solution to Wile’s complicated problem. This hand painted Limited Edition Cel is based on animation scenes in cartoons directed by Chuck Jones.